When the energy level dies down a bit, on the boat, or around the campfire, I sometimes kickstart the conversation by asking this question. 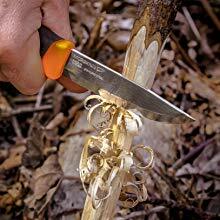 “What is the Best Wilderness Survival Knife”? … but before I ask this question, I make sure I have a Plan B. The action heats up quickly, especially if a “Crocodile Dundee Knife” is in attendance. Out come the stories of what is the best knife and why … and what the qualities of the best knife really are. I love asking this question, especially when the steaks are almost done, and I’ve managed to quench my thirst a bit. I’ll be the first to say, that these stories rank right up there with the best “fishing” stories. 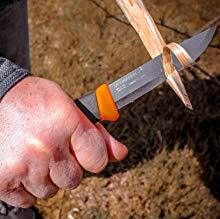 The Morakniv Companion Fixed Blade Outdoor Knife is a very popular knife for general outdoor use. It can be used for fire preparation, and in your camp kitchen. It features a 4.1 inch, 3/4 tang, stainless steel blade made of hardened Sandvik 12C27 steel. It maintains an edge well and stays sharp longer than carbon steel. The stainless steel blade is less prone to rust in outdoor and marine applications where knives are often exposed to dirt and moisture. Their patterned, high-friction grip fits well in the hand and provides superior control for safety and performance in cold and wet conditions. The Morakniv has a blade length of 4.1 inches (104 mm), a blade thickness of 0.1 inches (2.5 mm), and an overall length of 8.6 inches (218 mm). It comes with a colour-matching plastic sheath with an integral belt clip. The Morakniv Companion knife and sheath weigh 4.1 ounces (116 grams). It comes with a Manufacturer’s limited lifetime warranty and is made in Sweden. It makes an excellent companion for camping, hiking, hunting, and fishing, and can also be included in survival and emergency preparedness kits. International Shipping: This knife can be shipped to select countries outside of the USA. Learn more here. Over the years, I have bought, found, broken, and lost, many knives. I own 20 dollar knives and knives that cost 100’s of dollars. Do not be misled by the price. At $15.00 CDN dollars, you get real value for your money, a good bang for your buck. I have 4 Morakniv knives in my collection, two that I’ve purchased, one that my brother gave me, and one that I found in a pile of debris on a construction site. It would have been too much to expect the sheath to be included, however, it feels good in my hand and I carry often. It has become my go-to river fishing knife because of its stainless steel construction and the fact that it’s a true survivor. An excellent cleaner of fish, we have become close friends. I’m sure you have a few favourite knives in your collection. What is your favourite knife and why is it so? I would love to hear your replies and you can Contact Me here. I wait patiently! It’s very important to have a reliable knife at your side when in the great out doors. The dimensions of the knife sound ideal and looking at it performing in the images it’s perfect for the uses it’s designed forvand links extremely sharp. The different variants all look as though they do the job they were designed for. Morakniv makes an excellent product. Their knives are popular worldwide. This is a great knife for this price range. There are better knives on the market, but not at this price. 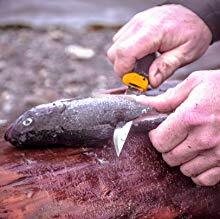 The Morakniv really seems the perfect companion for the fishing trips and wildnerness cooking. I personnaly don´t own any survival knife, but ine thing that bothers me is security. Does the Morakniv come with any kind of cover for the blade when not in use? Is it possible to machine wash the knife? How often do you recommend the blade to be sharpend? Good Day, Bruno, and thanks for reading my post. Any knife can become a survival knife when needed. This IMHO this is an excellent knife for this price range. It is very popular, worldwide. It is not a 3 or 4 hundred dollar knife, but it is more than adequate for its purpose. It does come with a plastic sheath to protect the blade. I’m not sure what you mean by “machine wash” the knife. Perhaps you can further explain this to me. Every blade needs sharpening only when it gets dull. This depends on what you’re cutting and how you treat your knife. Someone once said that the best companion you can have when lost in the wilderness, is a knife. I’ll say the best companion one should have when lost in the wilderness is the Morakniv Outdoor Knife. Reading this review, I fell in love with the knife. And just for 15$ you get that quality. This is an excellent knife for this price range. I agree with your knife theory and would add that if you were lost in the bush, a knife would be the most difficult tool to reproduce. This is a great product. I like going for hunting and fishing but most often, I turn to be disappointed because the knifes I always buy turn to get Blount very fast. This always give me low spirit and always force me to be walking around with a file to sharpen the knife but with this one you just talked about, I am going to give it a try. I’m happy to hear that you hunt and fish a lot. Your blades will remain sharp if you don’t hit bone with them and if the steel is of good quality. That being said, I suggest you use a whetstone instead of a file and then pass it over a knife-steel.